This album will help you to slow down your thoughts and deeply mentally relax. Do you have difficulty trying to relax after a stressful day or experience and it ends up replaying itself in your mind over and over again? Do your thoughts often race when you are trying to relax and you can’t shut them off? Do you have trouble trying to sleep at night because your mind is still active and your thoughts race? If you feel like your mind is controlling you, that you are not in control of your thoughts and you struggle to switch off and relax then this album is for you. 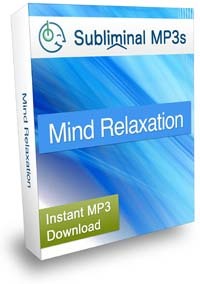 This subliminal mp3 will help you to calm your thoughts. It will change the way you respond to stressful triggers, and put you in control of your mind so you can slow your thoughts and relax your mind when you need to and when you just want to de-stress and relax. Over time your mind will get clearer and clearer,and you will find it much easier to sleep at night, or just to relax anytime you need to rest. If you practice meditation then this subliminal mp3 is an excellent way to help you control random thoughts from interfering, to slow your thoughts down and help you to reach a deeper meditation. Give you the power to relax your mind at any time. When thoughts that would normally cause you to stress or worry come to mind, new thoughts take over and you effortlessly enter a state of relaxation. You will no longer be bothered by the stresses of the day and will be able to take things in your stride and handle difficult situations better because of it. Allow you to enjoy recuperative sleep. Your thoughts will slow down, your mind will clear and you will naturally relax and unwind. This creates the perfect environment for your mind and body to prepare for rest so you can sleep more soundly and you will notice almost immediately how much better you feel because of it. Help you to deal with difficult situations in a much better way. You will handle stress much better because you are calmer, relaxed and able to make better decisions in every area of your life. This will give you a lot more confidence to deal with the things that cause you stress in the first place. This will give you a better outlook on your life because you will now have the ability to focus more clearly and not let stress cloud your thinking. Stop panicking, thinking irrationally or worrying needlessly. You will stop worrying so much as your mind slows down and your worries and tensions slip away. If you listen to your internal voice when it is at its worst / fastest then these are often because of worried thoughts. This album will help you to slow your internal voice and say goodbye to needless worrying. Take control of your mind and deeply realx with help from this unique subliminal audio session. This album is paired with our body relaxation album, so that whether you want to relax your mind or your body, our subliminal audio can give you some help.